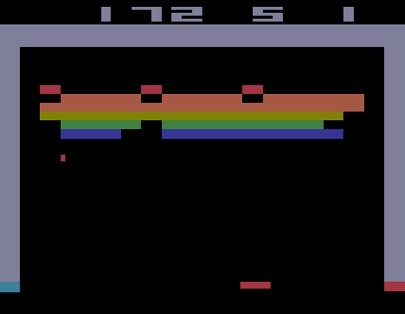 This is part 2 of a blog series on deep reinforcement learning. 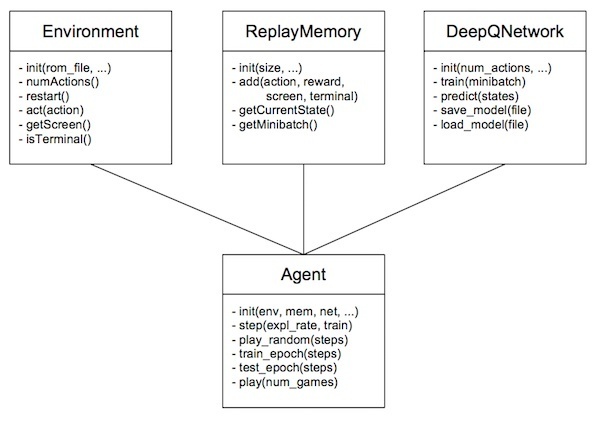 See part 1 “Demystifying Deep Reinforcement Learning” for an introduction to the topic. and finally how to modify Simple-DQN. 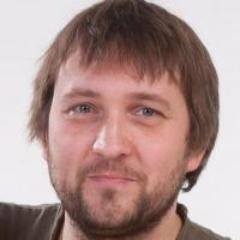 What You Can Do With Simple-DQN? It prints the testing results to console. To save the results to file, add –csv_file <filename> parameter. For all the plots you can see the random baseline (where it makes sense) and the result from training phase and testing phase. You can actually plot any field from the statistics file, by listing names of the fields in the –fields parameter. 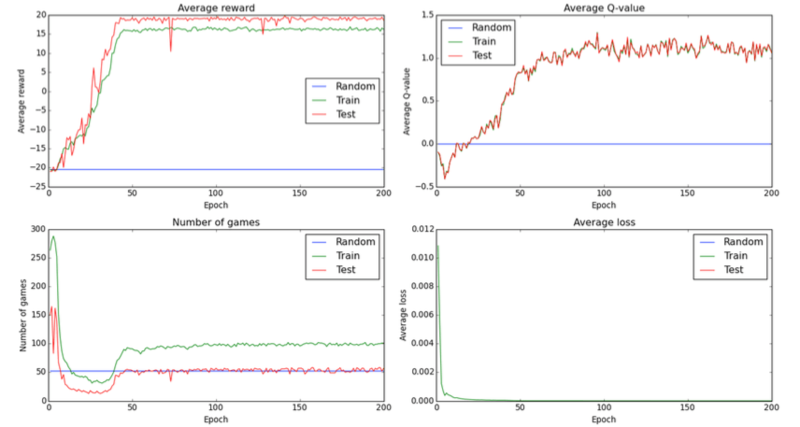 The default plot is achieved with –fields average_reward,meanq,nr_games,meancost. Names of the fields can be taken from the first line of the CSV file. There are 3 convolutional layers (named 0000, 0002 and 0004) and for this post I have visualized only 2 filters from each (Feature Map 0-1). There is also a more detailed file for Breakout which has 16 filters visualized. For each filter an image was chosen that activates it the most. Right image shows the original input, left image shows the guided backpropagation result. You can think of every filter as an “eye” of the AI. The left image shows where this particular “eye” was directed to, given the image on the right. You can use the mouse wheel to zoom in! Because the input to our network is a sequence of 4 grayscale images, it’s not very clear how to visualize it. I made a following simplification: I’m using only the last 3 screens of a state and putting them into different RGB color channels. So everything that is gray hasn’t changed over 3 images; blue was the most recent change, then green, then red. You can easily follow the idea if you zoom in to the ball – it’s trajectory is marked by red-green-blue. It’s harder to make sense of the backpropagation result, but sometimes you can guess that the filter tracks movement – the color from one corner to another progresses from red to green to blue. The first layer filters focus on abstract patterns and cannot be reliably associated with any particular object. They often activate most on score and lives, possibly because these have many edges and corners. Still one can spot occasional filters focused on score and lives even in higher layers. As expected, there are filters that track the ball and the paddle. There are also filters that activate the most when the ball is about to hit a brick or the paddle. How Does Simple-DQN Compare To Others? Another interesting measure is the number of training steps per second. DeepMind and simple_dqn report average number of steps per second for each epoch (250000 steps). deep_q_rl reports number of steps per second on the fly and I just used a perceived average of numbers flowing over the screen :). In all cases I looked at the first epoch, where exploration rate is close to 1 and the results therefore reflect more of the training speed than the prediction speed. All tests were done on nVidia Geforce Titan X. How Can You Modify Simple-DQN? Agent class just ties everything together and implements the main logic.